The premiers of Saskatchewan, Ontario are poised for a fight with the Trudeau government. Saskatchewan Premier Scott Moe and Ontario Premier Doug Ford walk to a reception as the Canadian premiers meet in St. Andrews, N.B., on July 18, 2018. As the premiers of Saskatchewan and Ontario brace for a fight with the Trudeau government on carbon pricing, a new poll suggests most Canadians believe provinces should have the last word. According to numbers released by the Angus Reid Institute Thursday, 64 per cent of Canadians agree provinces should have the final say on carbon pricing, while 36 per cent think the federal government should decide. Prime Minister Justin Trudeau has told provinces and territories they have until September to share details on how they plan to price greenhouse gas emissions, whether through a carbon tax or cap-and-trade program. Provinces and territories without a plan in place by January will have a carbon tax imposed on them, with the feds pledging to return revenues to taxpayers in those jurisdictions. A federally imposed carbon price would start at $20 per tonne and increase to a level of $50 a tonne by 2022. The plan was fiercely opposed by Saskatchewan, where Premier Scott Moe has launched a court challenge to check if Ottawa has the jurisdiction to do this. 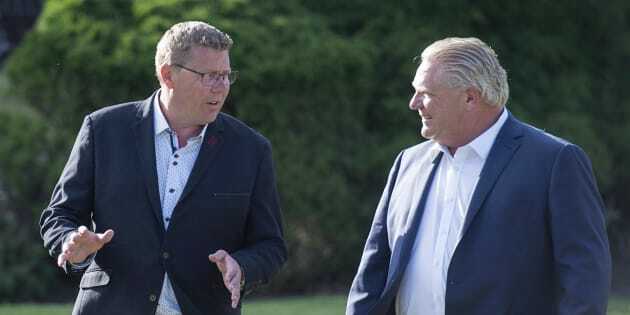 Moe scored a wingman in Doug Ford, whose Ontario Progressive Conservatives won a majority government in June while pledging to scrap the province's cap-and-trade program and fight a carbon tax. In Alberta, United Conservative Leader Jason Kenney plans to campaign heavily against carbon pricing in that province's election next year. Ford has already said Ontario will intervene in Saskatchewan's court case. Ford's government moved this week to gut Ontario's cap-and-trade system. The numbers suggest that, in every region of Canada, there is more support for provincial authority on the issue. And while it's perhaps not surprising that past federal Conservative voters oppose the Trudeau government driving the issue, nearly half of past federal Liberal voters — 48 per cent — also feel provinces should make their own calls. The poll also pegs overall support for Trudeau's carbon pricing plan at 45 per cent, down from 52 per cent when Liberals took power in November 2015. But the age of respondents appears to be significant. While 62 per cent of respondents between the ages of 18 to 34 support the federal plan, almost two-thirds of those over the age of 55 oppose it. The Angus Reid Institute also found what it called a "notable detail" while examining responses: that just 56 per cent agreed that global warming is a fact and "mostly caused by emissions from vehicles and industrial facilities." Twenty per cent of respondents said that while global warming is a fact, it is mostly caused by natural changes and 14 per cent agreed global warming was an unproven theory. Another 11 per cent said they were unsure. The Angus Reid Institute conducted an online survey from July 18-23 among a representative randomized sample of 1,500 Canadian adults who are part of the Angus Reid Forum. The firm says a probability sample if this size would carry a margin of error of 2.2 percentage points, 19 times out of 20.